Queensland twins Luke and Cody Cook, 24, have won House Rules for 2016. Luke was in tears after learning his mortgage would be paid off in full, after Johanna Griggs announced they had beaten Victorian couple Claire and Hagan. “To get my mortgage paid is absolutely unbelievable. It will give me the best head start in life and I will be forever grateful,” Luke said. The endearing pair, known for their personality and distinct voices, had been popular across the Seven series. Luke was crying openly as he told his opponents “I love you guys so much,” and invited them to visit. The series, which was filmed in 2015, began softly for Seven but soon gathered a following and increasing its ratings as the series progressed. Seven is already calling for new applicants for a 2017 season. 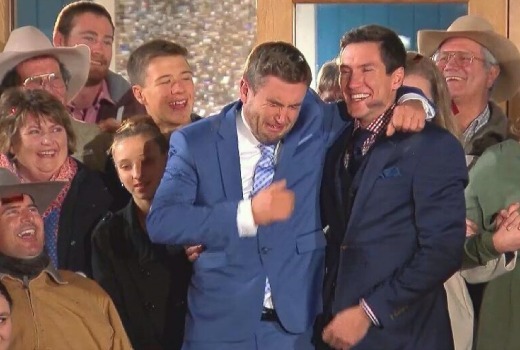 Such great larrikin guys, glad they won even though it would have been good for the Victorian couple to have also won, and yes it is a win – win show for everyone which is a rare commodity these days with reality shows. Great series and no surprise that as usual it just builds its audience throughout. It’s great to have a show where everyone really is a winner whilst the overall winner earns their prize purely through hard work and cooperation rather than backstabbing their way to victory. Such a positive show which is a pleasure to watch. With all due respect I have to completeily disagree with you. I hate House Rules because it is too nice and boring combined with to the typical tropes of 7’s reality series). I say bring on the backstabbing of Au Survivor. Also when the result comes down to a public vote, no wonder why they won because every promo was about them. I think this could be considered to be a form of favouring one team over another. I agree with you Brekkie, while there is some drama and relationship tensions between teams, It is a positive and feel good show! It is a shame that negativity and back stabbing in Kitchen Bitchen shows rates so much higher!?! How funny was it watching him trying to talk while crying. His face was all over the place. Seven would be happy given their mortgage was only $120,000 which is well below previous winners of the show. It was funny. He was so emotional, and such a lovable larrikin, they were both entertaining!.